These compositions were forged in the "sound-art laboratory" of Q-O2 Werkplaats in Brussels. Here, one of the workspace's directors, Julia Eckhardt, had been curating an archive of viola recordings exclusively played in G. This body of material was then turned over to French sound artist Manu Holterbach, who integrated the string pieces into his own electroacoustic constructions, based upon field recordings and instruments he'd made himself. "Eckhardt's recordings seek the rich if occasionally dissonant overtones that have been central to the minimalist works of Tony Conrad, Phill Niblock, Eliane Radigue, and Ellen Fullman. 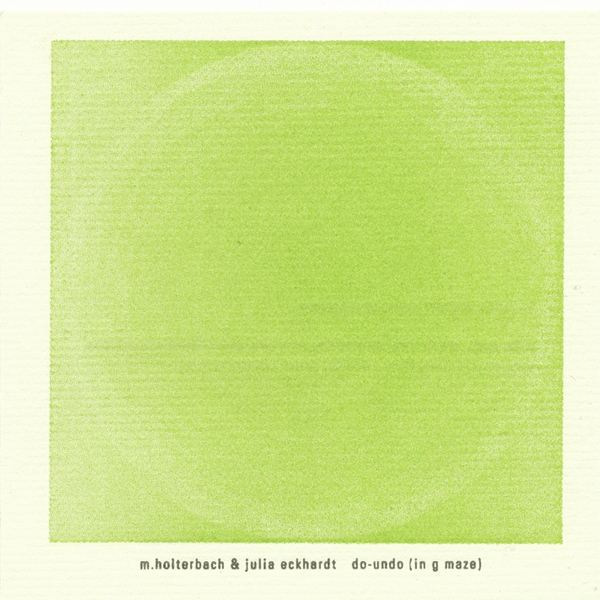 And in his reconstitution of her recordings, Holterbach populates his compositions with field recordings whose turbulent textures and bristling movements sympathetically weave amidst the rasping drones from the viola. On a rather technical level, Holterbach's field recordings on his composition "Two stasis made out of electricity" -- an arc lamp, the sounds of Parisian subways, an electric powerplant -- all naturally buzz with the same G of Eckhardt's viola, without the benefit of digital pitch shifting. The resulting drones transcend any conceits of conceptualism and strategic intent, instead seeing no difference between the sounds of the environment (man-made or otherwise) and the sounds of the academy. As such, Do-Undo (in G maze) will undoubtably please those with an ear for the aforementioned Phill Niblock as well as the controlled impressionism from Andrew Chalk."